Pricing Scheme (Item Pricing Scheme for Items priced by Category.) – If you want to have this item be priced based on a formula or other method, then you can create a pricing scheme and specify which scheme to use in the pull-down menu that is revealed when you make this selection. See Pricing Scheme Basics for more details. Pricing Schemes help you automatically calculate the desired margin on items in this category. USE WITH CAUTION! Whenever you choose to use a pricing scheme, you should be very careful if you also print price tags (with the price printed on the tag). Updating a Pricing Scheme will potentially change the retail price of any item using the scheme. Retail Discount – Use this option to apply a percentage or dollar discount to all items in this category when sold. Discount Dates – Once you enter in a discount the Discount Date fields will be opened to define the sale period for this categories items. 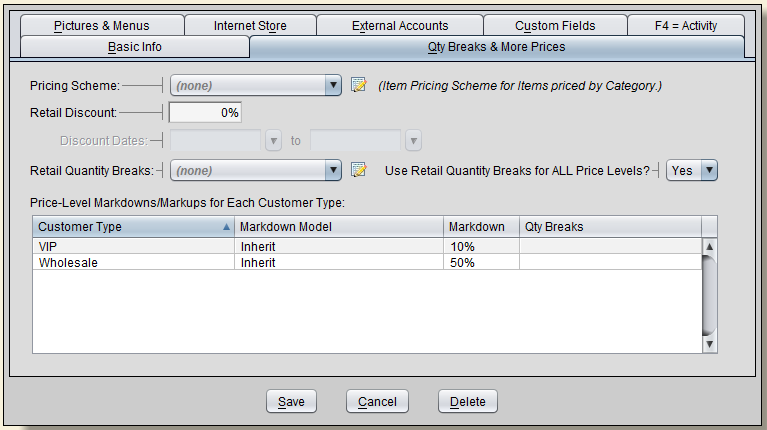 Retail Quantity Breaks – Use this option to apply a specific type of quantity break to an entire category based on the quantity purchased. Choose between different options including BOGO or Buy One Get One types of offers. Price Levels for Each Customer Type – for more detailed information on this subject please see Customer Types (Pricing Levels).